If you have been tasked with building an application security program, or your organization is starting to consider one, you may be curious where to start. Not only does application security rely on sound security understanding, it also relies on a fundamental understanding of software development. You must consider things like budget, or lack thereof, resources, priorities, and strategy when building an application security program. 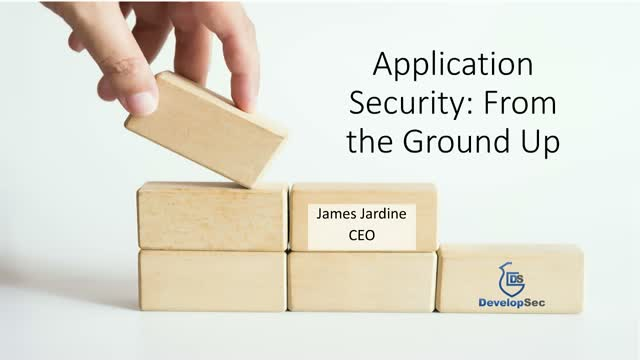 In this talk, James Jardine, CEO of DevelopSec, will talk about these different considerations when just getting started. Come learn some of the key elements to helping get your application security program started in the right direction. James Jardine is CEO of DevelopSec, owner of Jardine Software, an application security consultancy, as well as founder and regular contributor to Down the Security Rabbit Hole and DevelopSec podcasts. He has over 16 years experience focusing on application security and software development. James is a regular keynote speaker, including InfoSec World 2017.